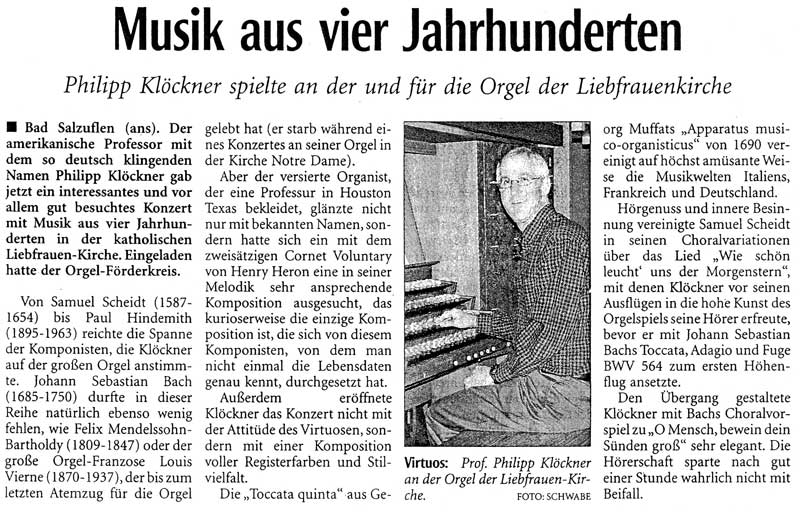 The American professor with the very German-sounding name, Phillip Kloeckner, gave an interesting and also well attended concert, playing music form four centuries in the Catholic Church of the Madonna, presented by the Friends of the Organ at the Church. At the great organ, Kloeckner played pieces by composers ranging from Samuel Scheidt (1587-1654) to Paul Hindemith (1895-1963). Of course, neither Johann Sebastian Bach (1685-1750) nor Felix Mendelssohn-Bartholdy (1809-1847) or Louis Vierne (1870-1937) could be left out. The latter lived for the organ until his last breath (dying during a concert playing his organ at Notre Dame). The highly proficient organist, who holds a lectorship in Houston, did not only shine with well-known pieces, but also chose an attractively melodious piece in the two-movement Cornet Voluntary by Henry Heron, the only popular piece by this composer, whose dates are unknown. Kloeckner opened the concert not with a virtuosic attitude but with a composition full of register colors and multitudes of styles. The "Toccata quinta" of Georg Muffat's Apparatus musico-organisticus, from 1690, combines in a most amusing way the musical styles of Italy, France, and Germany. Kloeckner pleased his listeners with the musical delight and intense reflection of Samuel Scheidt's choral variations. Excursions into the high art of the organ and the first climax were achieved with Johann Sebastian Bach's Toccata, Adagio, and Fugue BWV 564. Kloeckner arranged the transition (between the choral variations and the Toccata) very elegantly with Bach's choral prelude to O Mensch bewein dein Sünden groß. The listeners did not stint at all with applause after an hour of music.